I’m not really a fan of Oreos, but when picking recipes for Carroll Cafe I like to pick things that I wouldn’t normally make myself. However, these bars might just turn me into an Oreo fan! These are rich and decadent treats. 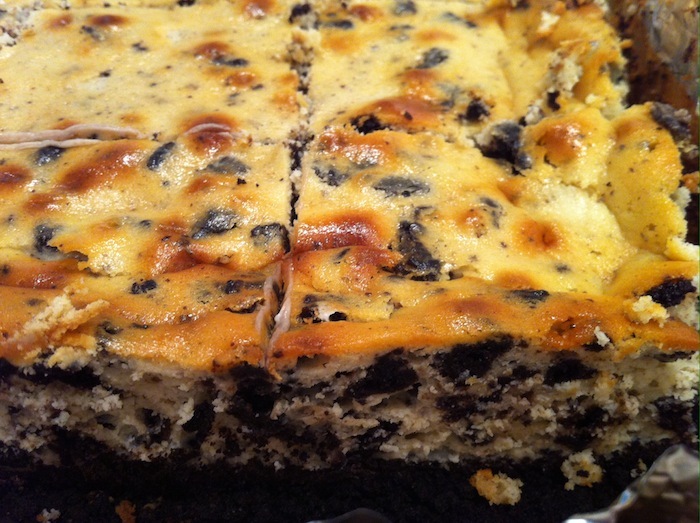 The cheesecake is creamy, the Oreos add a nice crunch (although they soften up by the second day), the cookie crumb crust adds extra chocolate. They’re pretty incredible, even if you think you don’t like Oreos. Preheat oven to 325°F. Line a 9×13″ baking sheet with foil or parchment paper and set aside. To make the crust, process the chocolate wafers in a food processor until crumbs. Pour in the melted butter and pulse several times until butter is well distributed. Pour crumbs into the prepared pan and press into an even layer. Bake for 9 minutes, remove from oven and let cool on a wire rack. Leave the oven on. For the cheesecake, beat the cream cheese on medium-high speed until smooth. Gradually add sugar and continue to beat until well mixed. Add eggs one at a time, beating well after each addition. Scrape down the sides and then beat in the sour cream and vanilla. Gently fold in the chopped Oreos, then pour batter over the prepared crust, smoothing into an even layer. Bake until set, about 55-60 minutes. Cool on a wire rack for at least 2 hours, then refrigerate for at least 3 hours, or up to 24 hours, before serving. To serve, pull cheesecake out of pan using the foil or parchment paper, then cut into bars. not a fan of oreos?? who ARE you? how are we friends? ?